These adorable FARM ANIMALS are quick, easy, and fun to make; and also so versatile! You can make a lovely garland for a kid's room or nursery decor; even better, you can add them to a very cute baby mobile. 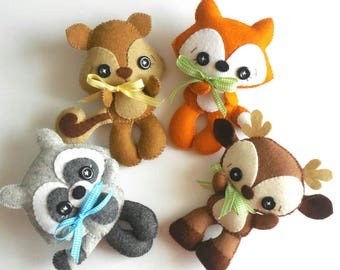 This PDF document will give you instructions and patterns to hand-sew all FOUR animals. This set includes a LAMB, a HORSE, a PIG and, a CHICKEN they all measure about 4 Inches. amazing pattern!! so cute and easy to follow! love your patterns!! !